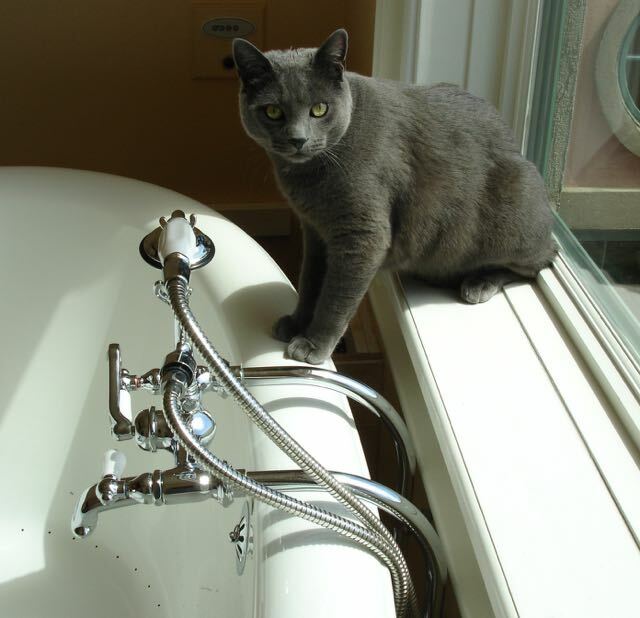 This morning, I sat on a stool in my bathroom for almost thirty minutes watching my cat, Poupon, study the faucet on our tub. Just before I walked into the room, he somehow managed to turn the knob just enough for the handheld shower to slowly drip, drip, drip water into the tub below. By the time I arrived, he was sitting on the windowsill next to the faucet, trying to figure out where the water was coming from. As I sat staring at Poupon, I was taken by his intense curiosity, his precise, present moment focus, and the obvious wonder he had at seeing water droplets in a whole new way. I laughed to myself as he repeatedly sniffed the faucet trying to figure out where they were coming from, then carefully touched the water drops with his paw when they finally fell, only to wait patiently with steely determination for the next one to come. Watching Poupon made me think about the benefits of seeing the world in a new way. Just imagine. How could wonder return to your life if you saw life through the eyes of a cat or dog? How would a problem get solved with a new perspective – maybe the view of a teenager, a grandmother, or an alien from another planet? Who might you fall in love with again if you were able to see that person in the way you did when you first met? Perspective is a powerful healing force. When we shift how we look at something, we open the door to new possibilities. For example, if you choose to see a problem with a co-worker as a gift instead of a hassle, you might discover that this person is trying to teach you about compassion or forgiveness. If you view your boring commute through the eyes of a bird in flight, you might see something miraculous that you’ve never noticed before. Or, imagine viewing your desire for a more passionate life through the eyes of a child. There’s a good chance that you’d laugh more, find joy in unexpected places, or smile at the simplest things. Today I choose to see my life through the eyes of Poupon and I look forward to discovering the brighter side of ordinary. In this week’s video, you learn about what it takes to fall in love. So powerful… You can watch it here.